The Bill and Melinda Gates Foundation is the largest private foundation in the world. Private foundations get their money from a family, an individual, or a corporation; in this case, the Gates family. In 2014, the total giving for the foundation was $3,439,671,894, the highest of any US foundation. Although I didn’t get to speak with Bill or Melinda, I was directed to some excellent interviews they gave. I was looking for what inspired the couple, possible failures, and how they work together. Maybe you will be inspired to directly share your story on GrantNews.press! Multiple sources reported that Africa inspired Bill and Melinda Gates. In 1993, the engaged couple took a trip to Africa where they were struck by the poverty. Melinda asked Bill, “Does it have to be like this?” In 1997 they went to Africa again; particularly Soweto, South Africa. They witnessed a hospital treating TB which was overwhelmed by the number of patients. What are the biggest inequities, globally? Equal opportunities in the United States. Bill has been most moved by the mortality rate of children under 5 years old. This is what he calls an “invisible cause” because it is not a cause most people are familiar with. People normally gravitate towards donating when disaster strikes, which is great, but there is need beyond that. He is happy to report that the mortality rate of children under 5 years old is on a decreasing trajectory. He sees increasing generosity towards invisible causes, now. Bill has been known to concede that they were naïve when they began the foundation. He said, “It’s been a learning process…” In a TED talk, he told listeners that he believes he was naïve about trying to wipe out Leishmaniosis in India. He reported that they wasted $60 million and 5 years on a vaccine that had to be administered every day for 10 days with modest benefit. The solution, they later found, was eliminating the sandflies that spread the disease. 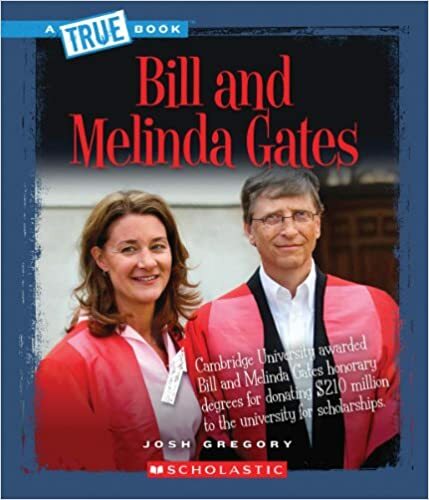 If you want to learn more about Bill and Melinda Gates, check out Bill and Melinda Gates (True Books: Biographies). You’ll learn about their childhoods and how they became the prominent philanthropists they are today. Don’t forget to share your story at GrantNews.press. In addition to the points of view of small businesses and nonprofits, we’d like to hear from the funding sources: the foundations. What type of foundation are you? What inspired you to begin? What have been some of your challenges? Be sure to share your path on GrantNews.press. GrantNew.press is looking for articles from researchers and writers who who have written the needs sections of successful grant proposals. The needs sections of federal proposals drive the goals, objectives, program activities and the evaluation objectives. Having been a federal grant reviewer myself – I have seen first hand when the proposed program will not meet the needs of the target population. We can predict this when each grant section was written by a separate individual in an organization that obviously had little or no communication. We’d love to hear about your hypothesis and how it drove the grant proposal. Did you write the grant yourself or did you have help? What guides did you use? Was there a peer-reviewed process? If you were successful in acquiring a grant, do you have tips for anyone else applying for a research and evaluation grant? We want to hear from health researchers, training researchers, teachers who show excellence in research, and more! If you have a story to share, do it at GrantNews.press. The following organizations recently benefited from the free publicity at GrantNews.press: Bottomless Closet of NYC and the Great Give. Bottomless Closet is a NYC nonprofit helping disadvantaged women prepare for job interviews. After we received a press release from them about their newly appointed Executive Director, we wrote an article about it. In the article, we showcased what Bottomless Closet does and attached links where viewers could go to their site and learn more. Similarly, the Great Give was a 24 hour fundraising drive for nonprofits in Palm Beach and Martin Counties, Florida. We wrote a promotional article for their event which gave them free publicity, as well. It was a successful event with over 500 participating nonprofits. Recently, we had Ellen Karsh, co-author of the book: The Only Grant-Writing Book You’ll Ever Need, write an article for us about how grant writers can learn a thing or two from the presidential candidates. In the article, she mentioned how colloquialisms don’t go over well in grant writing and, although presidential candidates make grandiose promises, how grant writers should stay away from doing the same. It made for a very fun read! You can write for GrantNews.press and receive free publicity. GrantNews.press is the premier newspaper for nonprofit and business leaders. GrantNews.press is an online newspaper dedicated to nonprofits, small businesses, and individuals. Experts provide unique expertise and experience within this field. Professors, doctors, research scientists and other virtuosos have written on various topics for GrantNews.press. Also, published authors write for GrantNews.press. Just sign up as a writer and pitch your article. At GrantNews.press unpublished authors in the nonprofit and small business community can become published. Halie Zenz, a volunteer for the Ohio organization, Guiding Light, wrote an article about domestic violence nonprofits finding grants. In the article, our editors showcased this organization on the other sites affiliated with GrantNews.press: GrantWatch.com, MWBEzone.com, GrantWriterTeam.com, Uhelpfund. These other sites are additional tools an organization in the grant application process can utilize. These are also sites you can write for at GrantNews.press!